Details Height Width Depth Weight 6.75" 15.4" 5.7" 14.87 oz. Details 40 g Protein. 0 g Trans fat. 0 g Sugar. Award winning taste! Made in the USA. 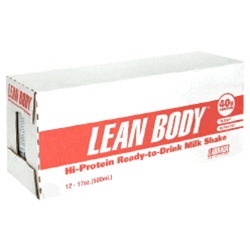 Nutrition Facts Serving Size 1 drink box Servings Per Container 12 Amount Per Serving % Daily Value Calories 260 Calories from Fat 80 Total Fat 9 g 14% Saturated Fat 1 g 5% Cholesterol 25 mg 8% Sodium 600 mg 25% Potassium 600 mg 17% Total Carbohydrate 9 g 3% Dietary Fiber 5 g 20% Sugars 0 g Protein 40 g 80% Vitamin A 25% Vitamin C 25% Calcium 40% Iron 25% Vitamin D 25% Vitamin E 25% Biotin 25% Chromium 25% Copper 25% Folate 25% Iodine 25% Magnesium 25% Manganese 25% Molybdenum 25% Niacin 25% Pantothenic Acid 25% Phosphorus 50% Selenium 25% Vitamin B12 25% Vitamin B6 25% 25% Zinc 25% Riboflavin 25% Thiamin 25% Trans Fat 0 g *percent Daily Values are based on a 2,000 calorie diet. Ingredients: Filtered Water, Lean Pro (Special Blend of Spray Dried Ultrafiltered Milk Protein Isolate, Yielding Fast Acting Whey Protein Peptides, Branched Chain Amino Acids, L-Glutamine Peptides, and Slow Acting Casein Peptides, Whey Protein Concentrate, Calcium Caseinate), High Oleic Safflower Oil, Cocoa Processed with Alkali, Cocoa, FiberPlex (Fructooligosaccharides, Cellulose Gel, Cellulose Gum, Carrageenan, Xanthan Gum), Vitamin and Mineral Blend (Potassium Phosphate, Potassium Citrate, Magnesium Phosphate, Sodium Ascorbate, Zinc Sulfate, Tocopherol Acetate, Biotin, Vitamin A Palmitate, Niacinamide, Phytonadione, Potassium Iodide, D-Calcium Pantothenate, Chromium Chloride, Copper Sulfate, Cyanocobalamin, Sodium Molybdate, Sodium Selenite, Folic Acid, Cholecalciferol, Pyridoxine Hydrochloride, Riboflavin, Thiamin Mononitrate, Ferric Orthophosphate, Manganese Sulfate), Natural Flavors, Soy Lecithin, Citric Acid, Sucralose, Salt, Acesulfame Potassium. *These statements have not been evaluated by the Food and Drug Administration. This product is not intended to diagnose, treat, cure or prevent any disease. Directions Serve cold. Shake before using. Refrigerate after opening.